‘If you notice anyone falling asleep…you will know that you are boring the hell out of them.’ The President of the Rotary Club pulls my leg during dinner. I can feel a lump of bread the size of a freshly baked roll lodge firmly in my throat and my heart takes pleasure in pounding against my ribs. A nervous laugh squeezes past the lump of bread. I have never embarked on any form of public speaking before and I am so grateful to have my best friend Gary by my side. I think back to the day towards the end of 2013 when a Zimbabwean contemporary of mine told me in no uncertain terms that there was absolutely nothing that one little person could do to make any difference in the fight against the scourge of poaching. I straighten my shoulders…as just over one year on….I am helping to make a difference. I allow my mind to meander back through the years to the untamed bush that I feel such an enormous part of and I can smell these animals that I am so passionate about and I feel confident that I am ready to stand up and be counted. I lead the audience back in time embracing the wide open sky and warmth of the African sun that Gary and I have been privileged enough to have spent our entire lives (apart from the last 10 years) enjoying. I share my adoration of these immense creatures with the room offering them a breathtaking glimpse into the world of the elephants. I can feel the emotion clawing up my throat and I want this audience to love and respect these soulful creatures as much as I do before Gary starts his talk with a graph depicting a grotesque and alarming annihilation of these animals and the continual ‘War Zone’ that they are battling to survive in. This is a graph that should shock any thinking and compassionate person into feeling a sense of alarm….and shame. There is silence in the room and I can see that these men are shocked at the horrific number of elephants that have been slaughtered throughout Africa over the last century and some…Africa’s elephants, rhinos and other wildlife is under attack from poachers, and many species face imminent extinction if the killing continues at current rates. It is then time to offer what we see as being such a huge part of the solution on the ground. I can feel myself bursting with pride at what has been achieved. 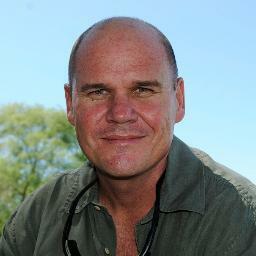 Chengeta Wildlife was started by Lisa Groenweg (USA) in conjunction with Rory Young, a conservationist on the ground. Rory Young, through Chengeta Wildlife has single-handedly trained 120 rangers in different African countries in the last year. 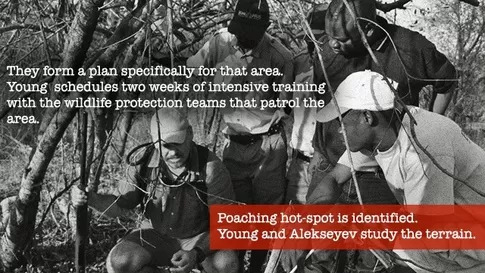 He has based his training on the strategies from the ‘A Field Manual For Anti-Poaching Activities’ that he has written in conjunction with Jacob Alexseyev. This manual is a first of it’s kind and is currently being put into modules by the University of Coventry. These 120 rangers have returned to their different posts and provided the skills and knowledge they have learnt from Rory to the men under their command. As a result…750 rangers have now received this comprehensive training. ‘A huge THANK YOU to Joe Chernov, Robin Richards and Leslie Bradshaw for creating the infographic below for Rory Young and Chengeta Wildlife!‘ I urge you all to share the link far and wide for us. 100% of monies raised go directly to funding these training camps and Rory is producing fantastic results. For the past month Rory has been in Liwonde National Park in Malawi. 30 rangers received training and equipment in an advanced ‘Anti-Poaching and Trafficking Course’. A huge part of the training is an ‘In course live anti-poaching’ operation where Rory goes out with the trainees in the field and puts in practice the methods they have learnt during the course. These men have managed to apprehend some 33 poachers in Malawi in the last month. Chengeta’s reputation is spreading and a further 12 countries have asked for our help….Rory’s itinerary for 2015 is full. 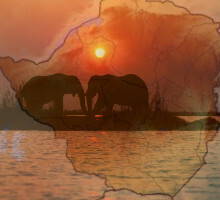 I loved my evening and am delighted that two more talks have been organised with dates to be confirmed and I know that between working with the schools and doing more presentations….our itinerary for raising awareness on the plight of the African wildlife…..
And showing people what Chengeta Wildlife are achieving….our 2015 itinerary is also going to be full. We all have a voice…Please use it. A feeling of warmth embraces me despite the chilly blustery breath of winter that leaves frozen kisses on the nape of my neck. Pushing my hands deeper into the toasty pockets of my warm coat I quicken my steps, bending into the wind. I smile brightly at the two young students who bounce up to the playground gate to welcome me in with twinkling eyes and cheerful voices. I wend my through the noisy happy silence shredding playground into the warmth of the reception area where I sign in before rubbing my numb hands, trying to get the blood circulating. I am met by the lovely teacher, Rebecca who also greets me warmly and we both disappear down the corridor and into the bright and uplifting classroom. I take a seat allowing my eyes to roam around the room enjoying the colourful artwork beaming down from the walls…..a little piece of every child’s personality brightening up the room. My heart flutters madly in my chest….’No pressure.’ I whisper to myself. I always did like a challenge and hoped that this young boy would enjoy the afternoon. My tongue suddenly feels a little dry as the inner folds of my cheeks glue to the roof of my mouth. I can feel 23 pairs of mischievous eyes on mine as a shy ray of sunshine breaks free from the gray cloud and spills gently through the classroom window. These children had spent precious time that morning looking at ‘Chengeta Wildlifes’ website, and watching and listening to a clip of Rory Young talking about the problems facing our wildlife….and they are ready for me this afternoon. I start to talk, knowing that I need to grab their attention within a few words. I lead them back in time to my first memory of seeing a dead elephant and I can see their eyes widen in surprise and shock and despite the sound of my voice, I can also hear the veld gently breathing and feel the warm sun embracing my bare arms. Almost an hour later we are still discussing not only the magnificent African elephant but Chengeta Wildlife, my blog and the different words and phrases I use to appeal to my readership. This class of hungry minds fill me with unblemished optimism. They are the future custodians of this magical planet that we all share. If I can help them to see as the eagle sees, we will improve our impact on this world we call earth. Two hours of lively interaction with these wonderful young people is like balm for the soul and again I cannot talk highly enough at the quality of teaching and the respect shown to me by the children. I take great pleasure in sharing three short essays with you all. Megan (9), Ben (10) and Amelie (11), and I can feel my heart bursting with pride…such incredible insight, depth and wonderful powers of description from all of them. Ben, I am pleased to say…stayed with the class….he did not go to his extra maths lesson and has written an amazing piece of work. Please enjoy and feel free to comment as they will be reading this blog. Do you need ivory ornaments? No. People don’t need to kill elephants for beautiful jewellery, because there is already something beautiful out here. 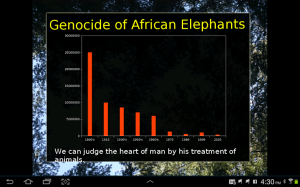 To kill a whole elephant just for its tusks is cruel. These creatures are heart-warming and have emotions too. 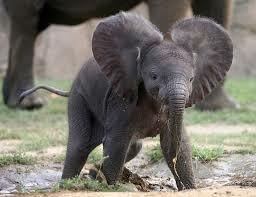 There are only 400 000 elephants left in Africa and one hundred die every day. We need to act quickly. If this carries on, I’ll be telling tales of when elephants were alive when I’m older. I don’t want to do that. I want to tell tales of how we managed to save the elephants from near extinction. 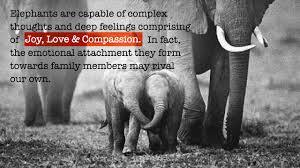 When I saw a clip of elephants helping each other to get the baby out of the water, I realised how much like humans they are. Some elephants policed the area whilst others guided the baby out of the water. It was amazing how elephants worked as a team, just like we would if we were trying to get a baby out of the water. Why do elephants deserve to die? They don’t. So why do we kill them? So that some rich person can wear an ivory trinket. 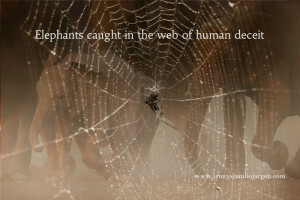 Over one hundred elephants die every day due to greed and poaching. Poaching is a monstrosity that should be stopped. When the matriarch, the leader of the herd dies, the rest of the herd may go delinquent, meaning that they will run and destroy villages, causing the whole herd to be shot, and why? 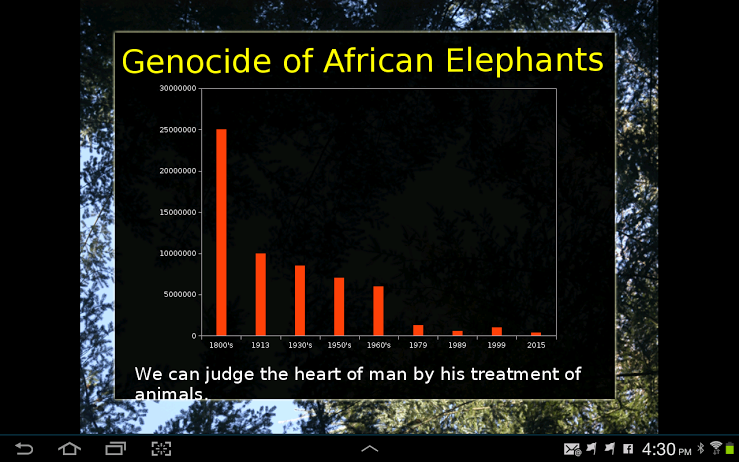 All because one poacher shot a wizened old elephant for a tusk. Imagine that you are in the bush, imagine that you wake up in the morning, to find this: I fall to my knees, tears falling down my cheeks, an elephant, stone dead at my knees. Halfway up its flank is a small round hole. Its tusk is gone, and this poor creature is dead, and why? I look up, squinting my eyes into the bright early morning sun. And to my horror I see lying on the horizon the body of yet another dead elephant. 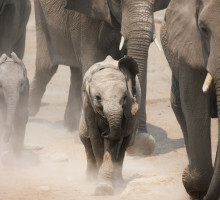 I swear that I will come back here, for the elephants of Hwange need our help. For they are declining, one every fifteen minutes. Why do elephants deserve to die? They don’t. These heart-warming creatures have strong emotions but now unfortunately have to watch every step they take along the scalding dusty ground. 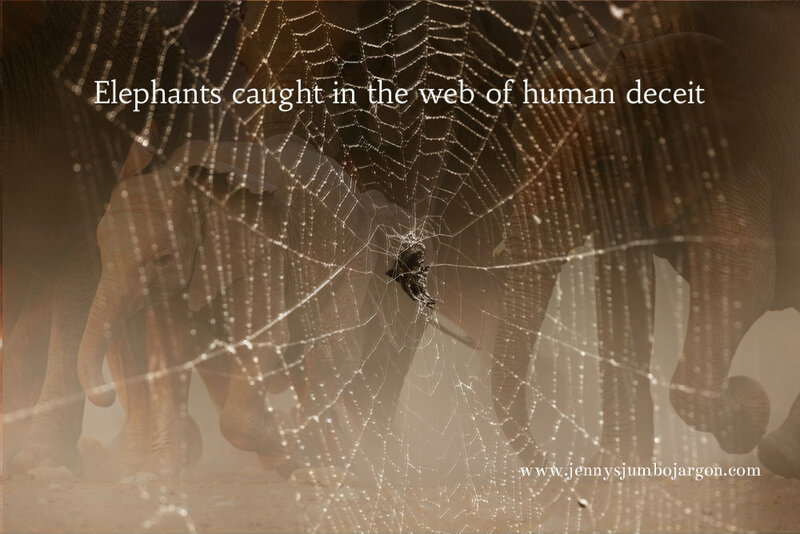 As most of us now know, one hundred elephants die every day and fewer are born. Plodding along, the elephants police their young, making sure they are following the almighty, knowledgeable leader, guiding them to the next safe stop. At their next stop the young elephants have hungry minds and venture through the unknown canopy of trees that haven’t got their exotic green raincoats on because they have been scolded by the forceful sun. Once the youngsters stop they dance and skip around like young children in the playground. As for the teenage elephants, left alone they are a delinquent gang, chilling in the sun, squirting cool refreshing water over each other. Soon after their fun stops for the wise old elephants are ready to start their next trek into the exhausted horizon. Whilst on their trek the leader picks up on danger warnings echoing all over Africa’s deserted plains. These valuable elephants can pick up a warning from a very far distance, a bit like humans and their mobile phones. After the warning, despite being gentle creatures, these grey, wrinkly animals are prepared to fight in one big mass of power, making great swirls of gold dust. I can now see why Jenny is hypnotized by these tremendous animals. I now look forward to my next visit to this magical classroom where I will be reading and looking at their ‘blogs’. How exciting is this? Only by listening can we hear the desperate cries from the ever declining population of wildlife. 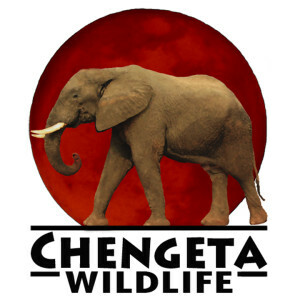 Become part of the solution….look at our ‘Chengeta Wildlife’ website, like our Chengeta Wildlife face book page, share it and help if you can. Victoria Falls….one of the seven natural wonders of the world. A powerful 1.7 kms wide curtain of Zambezi water thundering over the 100m drop…a roar that can be heard from 40 kms away. A plume of spray and gossamer mist reaches high into the azure heaven…a spectacular watery mirage of tear drop silver. While elephant lovers around the globe celebrate China’s one year ban on ivory imports, these same eyes will be focused on this paradise where ‘celebrations’ of a different kind will be taking place. Mugabe, although a shadow of his former self will be gnawing his way through an elephant steak as he presides over his 91kg cake in one of the most beautiful settings in the world. Guests will feed their over stuffed bellies while Zimbabwe’s poor drift in the stream of poverty, disease and unemployment. The guests…in a trance of full bellies, beer, golden sunsets and sultry breezes do no waste a thought on the poverty of their fellow Zimbabweans or on a boma full of captured elephant calves in Hwange. Zimbabwe’s ruling party…a cauldron of toxic crime and corruption watch on with unfathomable eyes and itchy fingers. Zimbabwe is my home country even though I watch from afar. With Mugabe’s birthday rhetoric…my heart bashes against my rib cage. What will become of the wildlife that walk in the untamed splendour of the Zimbabwean bush? However, I do not look the other way. 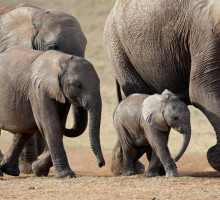 I will continue to fight for the elephants, rhinos and other precious wildlife. 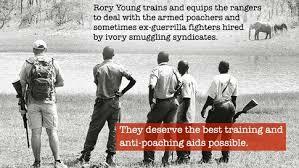 I will continue to saturate the air with hope as Rory Young continues to give of his time, knowledge and skills to Anti-Poaching Units through out Africa. We need your help. Please continue to share our posts and donate if you can.